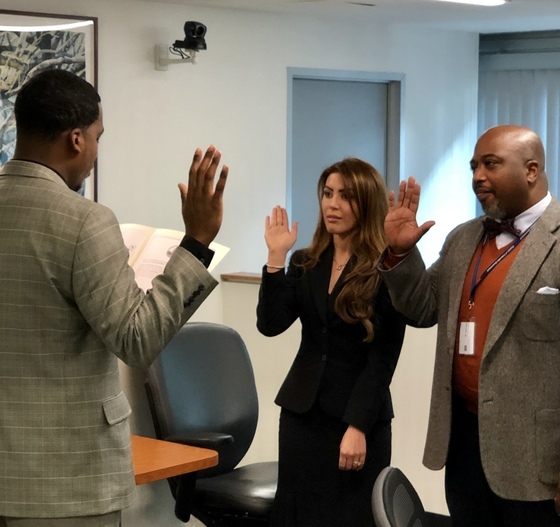 The Alcoholic Beverage Regulation Administration (ABRA) welcomed Rema Wahabzadah and Bobby Cato, Jr. on Wednesday, Jan. 24, as the newest members of the Alcoholic Beverage Control Board (Board). Their swearing-in brought the total number of Board members to its maximum of seven. Wahabzadah, a Ward 6 resident, brings an illustrative legal and consulting career to the Board and currently serves as Advisory Counsel to Cary Rx and as Legislative Counsel to the Statehood Initiative Agency. In the past, she has served as an Associate Attorney with Paul Strauss and Associates, P.C. and as a Business Development Manager at Fluor Corporation. Cato, a Ward 5 resident, is a Senior Associate at Central Properties, LLC. He previously worked as a Consultant for CGH Marketing, LLC and has developed and implemented several public-private partnership community engagement campaigns and programs here in the District and around the country. As a skilled project manager, events manager, and outreach specialist with over 15 years of experience, he brings a wealth of knowledge and leadership to the Board. Wahabzadah and Cato, began officially serving on the Board with Chairperson Donovan Anderson and Board members Nick Alberti, Donald Isaac, Sr., James Short, Jr., and Mike Silverstein immediately after being sworn in. Hearings are open to the public and held regularly on Wednesdays.The Board’s weekly calendar and agenda notices can be viewed online. Their nominations were approved by the District of Columbia Council on Jan. 9, 2018. All class A wholesalers, manufacturers and off-premises retailers (liquor stores) in the District are due to renew alcohol licenses by Monday, April 2, 2018. The Alcoholic Beverage Regulation Administration (ABRA) mailed out renewal packets to licensees on Feb. 15. A license can be renewed once the renewal notice is received in the mail. Before renewing, licensees should make sure they have updated their contact information with ABRA if they have a changed mailing address, email address, or phone number. Next, licensees should verify that they are in good corporate standing with the Department of Consumer and Regulatory Affairs. Finally, licensees should ensure that all outstanding taxes and fines are paid. Payment for licenses can be made for the next three years or for one year only; however, payment is due at the time of renewal. In order to avoid long lines, licensees are encouraged to submit renewal applications to ABRA as early as possible. 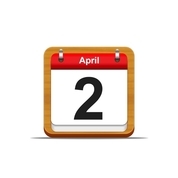 Renewal applications not returned by the April 2 deadline will be subject to a late fee of $50 per business day—not to exceed the cost of the license—and cancellation. Complete class A renewal information is available on ABRA's website. Due to a change in District law, any off-premises class A retailer that does not have a brick-and-mortar location open to the public and only sells alcohol over the Internet is required to have its license converted to a class IA or class IB Internet retailer's license at the time of renewal. All class A licenses are due to renew by Monday, April 2, 2018. License renewals and payments may only be completed in person at the Alcoholic Beverage Regulation Administration’s (ABRA) office, which is open from 8:30 a.m.-3:30 p.m., Monday-Friday. The office is located at 2000 14th St., NW, 4th Floor, Suite 400 South, Washington, DC 20009. A licensee can pay for one, two or three years of a license at the time of renewal. If you choose to pay for your license on an annual basis, you will be billed each year for any unpaid balance. Payment can be made by Visa, MasterCard, American Express, Discovery, check or money order. A check or money order must be made payable to the D.C. Treasurer. Please be advised that renewal for any license will be suspended if all outstanding fees and citations are not paid. Beginning Tuesday, April 3, 2018, a late fee of $50 per day will be imposed on the licensee. The total amount of late fees may not exceed the annual cost of the license. Complete class A Internet-only renewal information is available online. ABRA mailed a payment notice to the licensee's mailing address on file. Licensing fees should be paid on time. A late fee of $50 per day will be assessed starting Wednesday, April 3 for any late payments, which may not exceed the cost of the license. Licensees that have questions can contact ABRA by emailing or calling (202) 442-4423. New or renovated full-service grocery stores can now apply to sell beer and wine for off-premises consumption in Ward 4 under a new law that took effect on Thursday, Feb. 15. DC law L22-0057 or The Ward 4 Full-Service Grocery Store Amendment Act of 2017, was passed by the District of Columbia Council and signed by Mayor Muriel Bowser on Dec. 20, 2017 and expands the area where class B retailer licenses for businesses that qualify as full-service grocery stores can be issued in Ward 4. Under the previous law, new alcohol licenses could not be issued to full-service grocery stores located in Ward 4, with one exception. Specifically, only new or renovated full-service grocery stores located within Advisory Neighborhood Commission 4C07 were permitted to obtain a class B license to sell beer and wine, provided that the store did not devote more than 3,000 square feet of space to alcoholic beverage sales. The new law expands the exemption to allow any full-service grocery store located in Ward 4 to apply for the issuance of a class B off-premises retailer’s license. The measure also eliminates any restrictions on the amount of space a Ward 4 full-service grocery store can dedicate to alcoholic beverage sales. In addition, the changes allow new or renovated grocery stores in Ward 4 to sell growlers of beer and wine for off-premises consumption. Full-service grocery stores located in Ward 4 would still be prohibited from selling single containers of beer, malt liquor or ale in sizes of 70 ounces or less. Full-service grocery stores are defined by District law as licensed grocery stores that offer a full line of food products, including products from at least 6 of 7 required categories, and provide those products in a required amount of dedicated selling space. A complete list of requirements is available online. 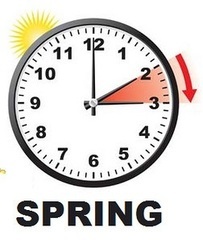 Spring Daylight Saving Time will cause the clock to spring forward one hour from 2 a.m. to 3 a.m. on the morning of Sunday, March 11. This will result in the loss of one hour, making that Sunday a 23-hour day. Because of this, District law allows on-premises establishments that normally close at 3 a.m. to operate until 4 a.m. on the morning of Sunday, March 11. This includes restaurants, taverns, nightclubs, hotels and multipurpose facilities. Licensees are not required to register in the program to participate in spring Daylight Saving Time. Licensees that have a settlement agreement or an Alcoholic Beverage Control Board order limiting hours of operation are prohibited from participating. Additionally, licensees enrolled in the Holiday Extended Hours program are eligible to operate with extended hours during the April 16, 2018 DC Emancipation Day holiday. Those enrolled can stay open the night of April 16 until 4 a.m. on the morning of April 17. Licensees interested can apply for extended hours by Friday, March 16, 2018. A list of registered establishments as of 2017/18 New Year's weekend is available on the Alcoholic Beverage Regulation Administration’s (ABRA) website. The complete 2018 holiday calendar can also be reviewed on ABRA's website. On-premises establishments can register for the program by submitting a registration form and public safety plan to ABRA at least 30 days prior to the first holiday a licensee would like to participate in. Once a licensee is registered and approved, the registration will be valid for the calendar year and each year thereafter. There is no fee to enroll. Complete details are available online. Licensees that have questions can contact ABRA's Licensing Division by emailing or calling (202) 442-4423. All pub crawl licenses issued in 2017 expired on Dec. 31, 2017. Promoters and organizers that are planning to host pub crawls in 2018 need to apply for a new 2018 pub crawl license. A pub crawl license application needs to be submitted to the Alcoholic Beverage Regulation Administration (ABRA) at least 60 days prior to an initial pub crawl event. Applicants must also pay a fee of $500 for the license, which is only valid for the calendar year that it is issued. A promoter or organizer that has an event proposed for early 2018 is strongly encouraged to submit the application as soon as possible. In addition to the annual license application, promoters and organizers are required to submit an event form, litter removal plan and other required documentation for each pub crawl that will have 200 people or more in the District. Pub crawls cannot be held on July 4, Oct. 31 and Dec. 31. Applications are subject to the approval of the Alcoholic Beverage Control Board and the District Department of Public Works. Complete pub crawl licensing information is available on ABRA's website. The Alcoholic Beverage Regulation Administration (ABRA) has a host of upcoming free trainings for licensees. 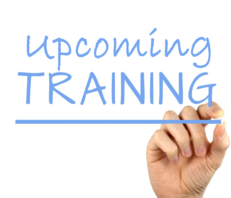 ABRA has added a number of new Licensee Orientation Trainings to its schedule this year. All new and existing licensees throughout the District are invited to attend. The next training will be held from 2-4 p.m. on Thursday, April 5, 2018. The training will cover District alcohol laws and regulations (including recent changes to the law), tips for working effectively with the community, settlement agreements, expectations of licensees and best practices, as well as noise abatement and sound management. Register online or contact ABRA Community Resource Officer Sarah Fashbaugh by Friday, March 30, 2018 by emailing or calling (202) 397-3971. Attendance for this class is strongly recommended for new license holders. Training is free of charge. Requests for interpreters may be made but must be submitted by the registration deadline. Training will cover food sales requirements and reporting, quarterly statement filings, and books and records tracking. For additional dates, please visit ABRA’s website. Register online or contact ABRA Compliance Analyst Monica Clark by emailing or calling (202) 442-4438. Residents and community organizations are invited to attend ABRA’s Community Training on Thursday, April 5, 2018 from 6:30-8:30 p.m. The training will cover District alcohol laws, protest processes, filing settlement agreements and ABRA resources and hearing processes. Members of the community that are interested in attending can RSVP by registering online or by contacting ABRA Community Resource Officer Sarah Fashbaugh by Friday, March 30, 2018 by emailing or calling (202) 397-3971. The Alcoholic Beverage Control Board (Board) will be on recess Wednesday, Feb. 21. ABRA's office will remain open and operate on Wednesday, Feb. 21. The Board will reconvene on Wednesday, Feb. 28.